What are the common health conditions displayed on a diseased kidney model that is designed to be three dimensional? A kidney model showing the various diseases associated with the organ can display many different symptoms. These symptoms or features are all designed to be represented on one kidney, limiting the amount of space that the model requires for storage and use. Typical conditions shown on a diseased kidney include urinary stones, tumors, scarring, infections and atrophy. In addition high quality models will also clearly show polycystic disease and the results of hypertension and diabetes on the kidney. The doctor can talk the patient through the various depictions on the model that are related to his or her condition. The model is also ideal for addressing treatment options and long and short prognosis for recovery or management of the condition. 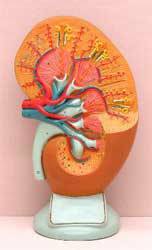 Can a kidney model be used in conjunction with a wall chart or education card with a patient? Using both a wall chart or poster that labels the parts of the kidney can be a very helpful tool to use in conjunction with the model. The poster or anatomical chart can provide very specific information about normal kidney functioning or the effects of diabetes, hypertension or other chronic types of conditions on the kidney. Often the model will provide more detail on the structural changes while the poster may focus in on prevention or treatment options. A doctor can use both the kidney model and the graphic representation to discuss any and all issues relating to diagnosis, treatment and functioning of the kidneys. The helpful information card that accompanies the model can also be very beneficial to allow the patient to follow along with the discussion. The card labels the structures in and on the kidney to help in developing a strong understanding of the organ. This can also be very important in discussing lifestyle changes that an help limit or reverse damage that has already occurred in the kidney due to chronic health conditions, infections or other health issues. Is a kidney model commonly used in general practice settings or only in a specialist's office? A kidney model that represents various types of conditions of this vital internal organ is essential in a number of different settings including a general or family practice. Since kidney problems are very commonly found in conjunction with other health conditions such as hypertension and diabetes, having a model can be critical in providing information to patients with these types of diagnosis. In addition the kidney model can be used to show a variety of kidney problems that may be completely unrelated to other health issues. Since most patients will first seek an appointment with their primary care physician being able to give information at the time of diagnosis and before referral to a specialist really can help the patient. He or she will get information about the suspected or confirmed condition and will be more informed to talk to the specialist about the condition.